For the past 30 months I have worked in the non-profit Veterans arena as Founder and CEO of Veterans Career Xchange (formerly Silhouettes for VETS). I have met numerous people and partnered with organizations that do an excellent job of working with Veterans and their families as they transition to civilian life. I have become part of many committees that assist those Veterans in need of civilian employment – we not only assist these Veterans but guide them toward a career. In these 30 months I have watched and read as the Media all but trashes Veteran non-profits because of those few organizations that take advantage of our transitioning Veterans for their own financial gain – they have become the “man bites dog” lead headline for the media. Yet the real stories of Veteran Service Organizations are those of us who are making a difference – but still no recognition or media headlines! Over the past year, there have been media reports about Veteran non-profits organizations spending up to 50% of the funds that are donated on their overhead which includes: parties, lavish organizational meeting, salaries, and other unnecessary cost that do not help our Veterans. Some of these organizations raised hundred of million of dollars only to see the donations used not for Veterans but for their own self gain. I have seen politicians tout the accomplishments of Veterans organizations only to find out that these organizations are not actually non-profits who are helping Veterans or in some cases are not even approved non-profit organizations! Unfortunately these are the stories that make news! The few non-profit organizations that take advantage of transitioning Veterans have made all of us who are committed to seeing the unemployment rate for Veterans decrease, eliminate homelessness, and address the substance abuse and PTSD issues look like we are doing this to make money off of our donors. Perhaps the Media should seek out those Veterans Organizations who are making a difference for our Veterans and who spend the majority of the funds raised to help Veterans. To every media outlet that has reported on these few Veterans non-profits who take advantage of Veterans I ask you to take a deeper look! Those of us who are helping and assisting Veterans as they transition to the civilian workforce, who become homeless and have substance abuse or PTSD issues, are doing this work with limited funding and just a simple commitment to assist our returning heroes. 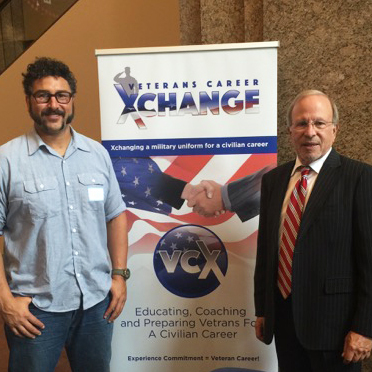 Veterans Career Xchange is an organization that is dedicated to educating, coaching and preparing Veterans for the civilian workforce. Our experience coupled with our commitment to putting a Veteran into a civilian career is unmatched when compared to other Veteran Service Organizations. In 30 months we have placed over 80% of the Veterans we have coached! We have been able to retain an astounding percentage of over 82% of those Veterans placed in career positions. So to all the broadcast media, print media and Internet bloggers who have reported on those Veteran organizations who are taking advantage of our Veterans, I challenge you to take a look at Veteran non-profit organizations that are making a difference by working to decrease Veteran unemployment, homelessness, substance abuse or PTSD issues! The Los Angeles Veterans Collaborative by USC (Center for Innovative Research for Veterans and military families) is an initiative that addresses Veterans issues – employment, housing, legal, faith based and substance abuse and PTSD. A scheduled monthly meeting discusses the issues and the solutions for transitioning Veterans with Veteran Service Organizations. It is time that recognition is given to initiatives that take pride in addressing the plight of our transitioning Veterans and the companies that make up the support for our transitioning Veterans, like Veterans Career Xchange.